Yellow seems to be big news again for 2018. It's certainly all over the shops at the moment, paired with green. Is it just me, or does yellow go with pretty much everything? 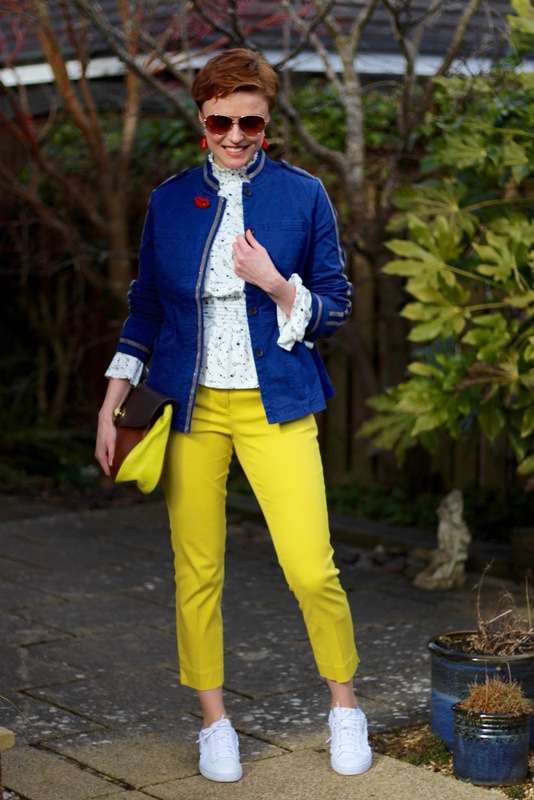 I'm wearing these bright yellow trousers with a brand new band-style beaded jacket that I just bought from Boden. I've given Boden a wide berth for a couple of years (apart from picking things up at charity shops) because I feel that the quality of some of their pieces has been seriously lacking. What was once a brand to be relied on has let me down on more than on occasion. It's so disappointing to pay good money for something that turns out to be no better than an item you could get elsewhere for MUCH cheaper. However, I always like to keep an open mind and when I saw this jacket online in the sale and decided to give it a go. For the sale price, it's a good (enough) bargain and the quality is much better than I expected. 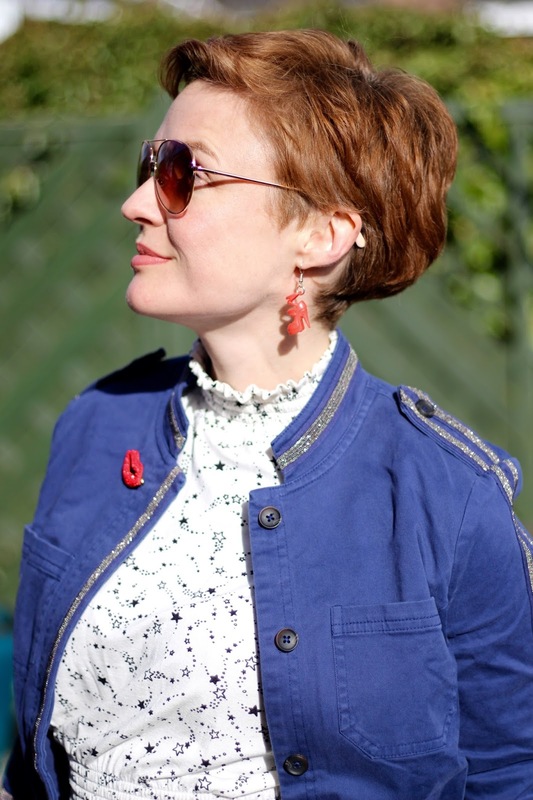 I'm not saying I'll be rushing back to Boden anytime soon but, for now, this jacket has me back on side. So, what is happening to some of our trusted brands? The standards are definitely slipping and quality is sometimes at rock bottom. I know the prices of materials are increasing, and brands want to maximise profits, but don't they realise that many of us would much prefer to pay a little more for reliable quality? Cheap items are 10 a penny and we can pick them up anywhere. I want to be able to rely on certain brands to deliver that little bit extra. I have (very) old Boden tops that are still going strong whereas a more recent purchase felt more like Primark than old Boden. Much as I love a bit of Primark I don't expect to pay Boden prices for it! Are some brands letting you down? What brands can you rely on to deliver on quality? Would you be happy to pay a little more for what you want? Or, is it cheap and cheerful all the way!? BLUE JACKET: Boden. (even cheaper now!!).. this one looks nice too. RED BARBIE SHOE EARRINGS: A gift. STAR TOP: Topshop, sold out but this one is nice. Last week Claire stole my heart with her Miss Piggy Shoes. OMG.... how quirky and fun are they?! Miss Piggy is, of course, a fashion icon and I love irregular choice shoes so this is a match made in heaven. Definitely agree with you on the quality issue. I have so much 'old Boden and the quality was superb. I've had 3 pairs of M&S trousers on the trot where the tiny hem has come down. It's very annoying! Stingy hems and rubbish stitching... arrggghhh...how annoying Gail! Hi Samantha, aww thank you so much for the feature. I still have not wore the Miss Piggy shoes outside yet as I love the cartoon drawings on the bottom of them and don't want to take it off, ha! Love your outfit, the blue and yellow would go perfectly with my shoes too :) Thanks for hosting. I know what you mean Claire! I've had a few irregular choice shoes over the years and was horrified when the soles were marked. You can buy stick-on sole protectors that will stop that happening. That's a great spring outfit, Samantha. Love the blue and yellow. I've noticed that Vince has stopped making tees and turtlenecks in the styles I like. I'm not sure why companies can't make some basics that they repeat year after year. Like Eileen Fisher does. I've not had any experience of these brands Susan, although I have heard of them.... I'm off for a look! SO lovely to see some of my faves from YOUR wardrobe here: the yellow pants, the lippie brooch, and the cute sneakers ahhh <3 Overall such a fresh, cool-girl spring look. I shop mostly from affordable high-street brands, and I do think most (MOST) of Zara things are good quality for their price. And Mango, too. I used to shop at Forever 21 but I found a lot of their tops to have that "fuzzy" look after a few washes, so I'm not a fan of that so much, but I do have a sweater and some other things from them that have lasted a while. Thank you for this comment Liyana. I had a look at the blog you suggested and it is full of fabulous colour!! Boden is great for that colourful impact and their reputation for providing fun combinations remains. Unfortunately their reputation for fantastic quality is slipping away... which makes me sad. I need to find a brand I can rely on for colour AND quality.... sigh. Have you seen the bright green puff sleeved midi dress in Zara this season? I thought of you, with an under-top and leggings of course! I need to re-visit Mango. They seem to have some lovely looking things and it's been a while since I looked properly. I think we can only buy online here in the UK, but I might be wrong? I'd love to have a rummage through the shops you have in Malaysia!! I've always wondered how different the styling on the mannequins in store would be?! Ahhh now I have to search for this bright green puff sleeved dress you talked about, as I haven't visited Zara in a while! I'll have a browse online, see if I can spot it. I have to be honest, I rarely pay attention to the styling on the mannequins in my local stores, as usually they don't manage to impress me every time. Do you look at mannequins in stores to get inspirations? The most recent ones I saw outside of Malaysia were in Milan and they were styled beautifully. I do look at the local mannequins still but only at the separate pieces a mannequin is wearing (and sometimes I go inside the shop searching for a particular piece from the display). Mango is fab, would love to see you wear some of their pieces! Cute outfit, we're both rocking the blue and yellow today! Thanks for sharing and hosting. Samantha, I am loving your sunshine pants! They have already brightened my day! And all the cute details...your earrings and your ruffled sneakers. So cute! And I do love Claire's fun shoes. She has so many! Have a fabulous week, my friend. My friend, who lives down in the south of England... sent me these funny barbie shoe earrings. They're very tongue in cheek, which I love. I'm glad they made you smile too! Oh, those yellow pants are so fun! I do think yellow is the perfect color for any season, Samantha!! In fact, I just purchased a pair of yellow jeans this weekend, so I could be a tad biased!!! I'm looking forward to seeing you style those! Miss piggy shoes? Whaaaaaa, fantastic! Love the bright yellow with the blue jacket. The military detail is a fav of mine, so cute. I only have one thing from Boden, my pink vintage style coat and it was a few yrs ago, quite pleased with the quality, but i know i can be dissapointed if it is a shop I frequent, thats a shame! You know i am a fan of the frilly sneaks. Thank you Jess... That pink coat of yours looks beautiful on you! I adore yellow so I do love these trousers, Samantha! I've been looking for a nice pair for some time now but I've yet to find them. I actually tried on a pair of bright pink ones today but they were just seriously lacking. They actually looked like one leg was longer than the other! So yes I agree – some shops do seem to be going down hill a bit. It's such a bummer!! I had that too Suzy! One leg of a jumpsuit was wider than the other and an inch longer. How does that pass quality control? Gosh Sheela, I totally agree with good quality accessories! We just need to work a little harder to find real quality at good prices I suppose? Maybe that's part of the fun?! I always change the buttons when I think they look cheap. I don't shop a whole bunch of retail preferring to stick to thrifted or vintage most of the time where I'm rarely if ever let down. I have found the Karina dresses to wear very well. Sometimes Anthro's quality isn't as high as it should be for the prices they charge which is why I only buy from them when the item has been super reduced. I've been tempted by Boden because of their bright colours and fun florals but of course the shipping stops me dead in my tracks. Just as well now that I know the quality isn't what it should be. I've been picking up a few really fun yellow vintage pieces for my store lately. Yellow really does say summer. Samantha, I certainly agree. Some brands have definitely lost their good materials and well-made clothes. Yet prices are the same or higher, no bueno. I certainly love your very bright yellow trousers though and how chic and colorful you look. The little red jewelry was perfect. You are wearing 3 primary colors. =) I have noticed a lot of yellow through the US stores too and just the other day I purchased a gorgeous yellow sweater, same color as your pants. P.S. I know you love my poetry so there is a brand-new one on the blog, right now. =) Also, welcome by and join my style linkup every Thursday. Thank you! I actually featured this outfit on Thursday Moda today and loved it. Check it out and link up again. =) Oh and I published a new poem on Tuesday, too. You've already inspired the purchase of my two pairs of yellow pants with great posts like this one Samantha. That little jacket is SO cute and I always love you in that color. I can't really speak to the Boden quality decline issue but I think many retailers want ridiculously high prices for clothes made of cheap fabrics like rayon. It's insulting to the consumer! It is insulting Judy! You're right there. I'm sure you'll get loads more wear from your yellow trousers this year too.